This highly aromatic gem of cheese was made famous in part by Wallace and Gromit, and also due to winning a number of awards for its awesomeness, hails from Gloucestershire, England. Its name actually comes from the liquor it is washed in; the hard cider from a local type of pear called the Stinking Bishop, not a commentary on clergymen. Full flavoured, milky, fruity, yeasty, beefy, this cheese has a sensuous texture you’ll love! Never underestimate a Greek Cheese! Greeks eat more cheese per capita than any other nation in the world, so it is worth exploring the variety that exists. Graviera Kritis (PDO) is a lovely sheep’s milk cheese from the mountainous regions of Crete. Delicious and nutty, affordable, and low sodium to boot, this cheese is always a good buy. I simply adore Brebichon, a farmstead sheep’s milk cheese that is oh so creamy, delicate and luscious. This apple washed cheese is an absolute must buy on every stop I make to Fromagerie Atwater in Montreal. 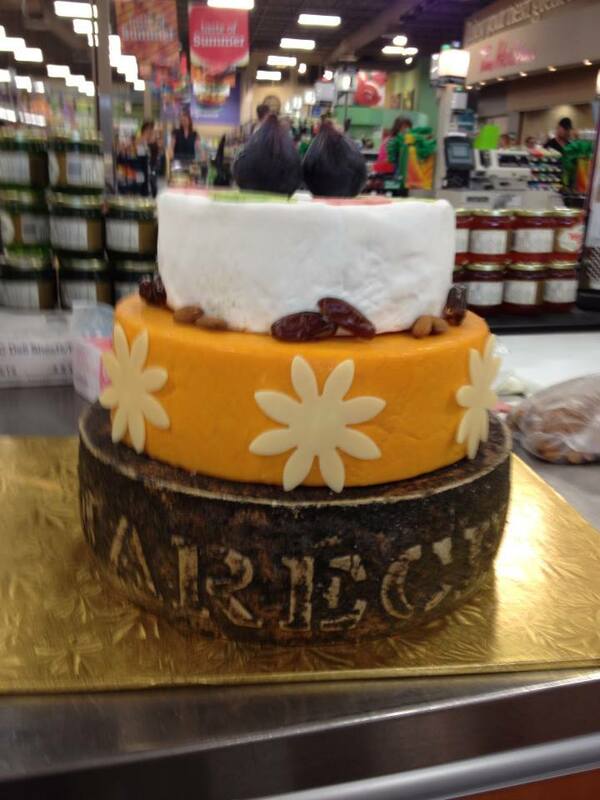 Today was pretty awesome – I got to create and deliver a wedding cake constructed entirely out of cheese. A lot more thought about what to use for the individual tiers than one would think. I had aromatic considerations, cheese calibre questions, product availability on a tight timeline. etc. My initial design(s) had to change when my specific wish list cheeses did not arrive, and again when the sizing of my backups was not working out. Decorating was a fun, creative challenge, and I think it worked out ok. It was a mad dash to the finish line, and with the muscle power of one charming, handsome customer who helped me lift the behemoth into the cab, it was off for delivery. 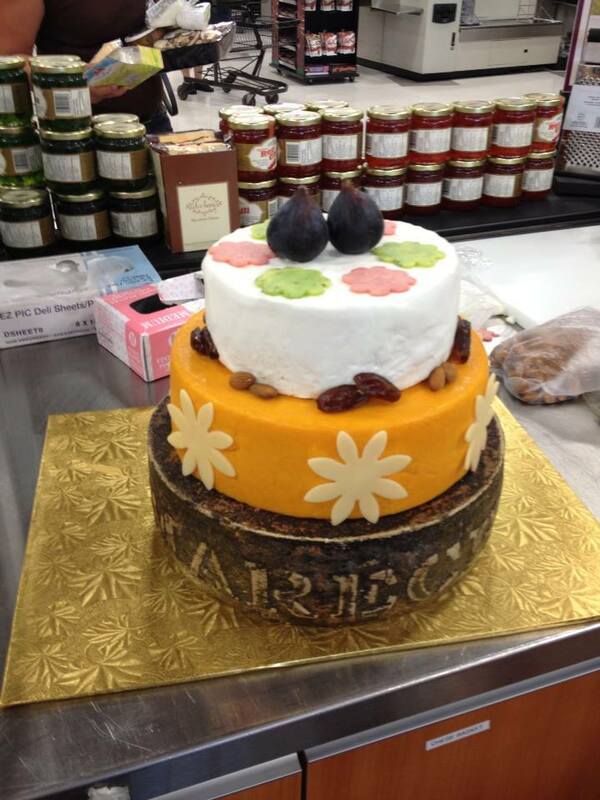 I delivered the “cake” into a busy kitchen of a nice downtown restaurant, where they were to transfer my creation to a lovely wood board, and arrange the dried fruit, nuts, etc on the new base. I really hope the bride, groom and all those who got to enjoy it loved it. Maple and Cheddar, together at last! Maple and cheddar, two quintessentially Canadian products come together in perfect harmony in Black River Cheese Company’s Maple Cheddar. Sweet and savoury, this cheese achieves a perfect balance of flavours.